The first ever teaser trailer for Christopher Nolan's secretive sci-fi/thriller, Inception, is supposed to premiere tomorrow attached to some prints of Inglourious Basterds. Word is that it won't appear online then (perhaps not even until next week), unlike the new Avatar trailer that debuted online today, - a day before it was supposed to show up in theaters. However, to tide us over until the Inception teaser appears, we have some new info that gives us some more insight into the mysterious movie: a description of the trailer, the names of the characters and a possible plot synopsis that expands on the tagline of "a contemporary sci-fi thriller set within the architecture of the mind," which is all we've had to go on so far. "Now, I wont give much away because it was a pretty good teaser trailer. It got you wanting more. Their is actual footage of the movie, with Leo and others. Their is one fight scene in what looks to be in a hotel hallway, but not just any fight scene. They were fighting all over the hallway, on side walls, ceilings everywhere. I thought Matrix (Don't panic it's not the matrix but thats what I came up with). Its gonna be a trippy movie. The end music kind of reminded me of Terminator, not the theme music but u will know what I'm talking about. Its only like a minute long and you will want to watch again to see what you just saw. All in all, it was really good." "It starts with the Warner Bros Logo in grey. Then you see Chris Nolan name. This dradle like thing is spinning around. Director of The Dark Knight words. You see Leo's face. Over shot of a city, shaking camera shot. Words come on screen "YOUR MIND". Shot of Leo. More words "IS THE SCENE OF THE CRIME" Then you see a glass of water, with the water in the glass starts to tilt. People fighting in hallway. Gordon-Levitt is one of the guys that's fighting in the Hallway, on the ceiling and walls. You see a quick shot of his face. The word "INCEPTION" comes up. Then SUMMER 2010." Just like the project in general, that sounds really intriguing. Obviously not as good as watching the actual trailer itself, but it's what we've got to work with until it appears online (or in theaters). The movie is starting to take shape, and it looks to be more... elaborate than I first thought it would be. "Inception is about entering peoples' minds/dreams. A technology to do so has been developed and is done through an injection. DiCaprio and his team work to enter the minds of other characters in order to retrieve/plant information." What do you reckon: is that really the plot? On the call sheet, DiCaprio is suspiciously missing, with the top main character listed as "COBB" as both the actor AND the character. That could mean many things: a code name, the character being kept secret, or a plain old mistake (I doubt that). 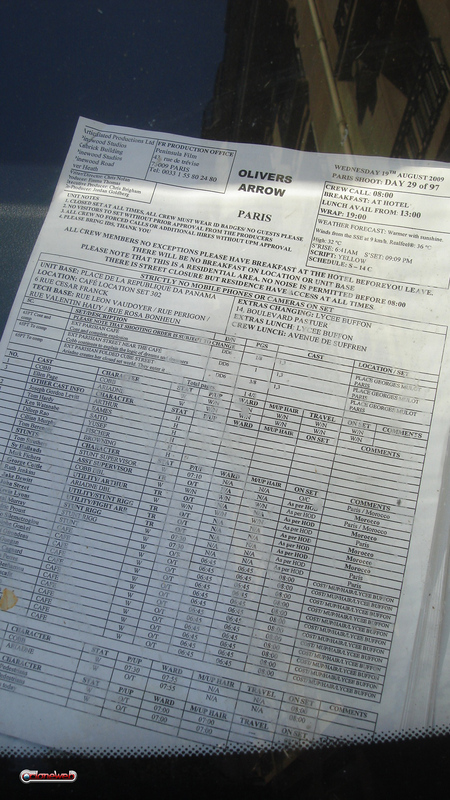 If you look closely at the image of the call sheet it says things like, "Cobb continues to explain the logic of dreams and dreamers." Wow. This project continues to sound really, really interesting to me as time goes on. Everything we've seen so far - even things as concrete as actual set photos - just add to the secrecy and mystery behind Nolan's first post-The Dark Knight film. As stated, the first footage/teaser trailer of Inception is set to premiere in theaters tomorrow attached to Inglourious Basterds. But for now, what do you think of this latest info about the movie? Inception has started filming in various locations around the world, with current filming taking place in Paris. It has a release date of July 16th, 2010.